Pacquiao vs Algieri results page. The welterweight title fight goes down tonight (Saturday November 22nd, 2014) at 9 PM ET join us right here for the full results from Macau, China…. 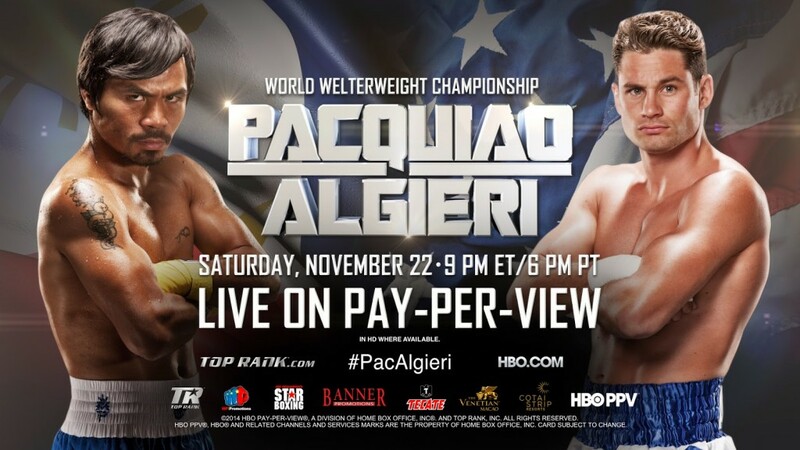 Check out the TSMPlug.com preview and prediction of Pacquiao vs Algieri here, or for full viewing info click here. The word around Pacquiao’s camp is that he has regained the hunger and speed that he lacked since the last Marquez fight. “Pac Man” was knocked out brutally in his fourth bout with the Mexican boxing hero, and looked off beat in his first fight with Timothy Bradley. Now apparently rejuvenated, will Pacquiao completely shut out the challenger in China? Check out Timothy Bradley’s prediction of Pacquiao vs Algieri here….See you on fight night! Pacquiao made his speed and ring experience count, absolutely battering “The King Of New York” over 12 rounds. His younger foe really had no answer, as Manny scored six knockdowns over the course of the fight.
.@MannyPacquiao retains his welterweight crown with a dominating unanimous decision win over @ChrisAlgieri. Scores: 119-103 (2x), 120-102. Thoughts that Algieri’s reach would come in to play proved to be premature, as his jab was rendered useless by the smaller southpaw. The scorecards reflected what was truly a dominant win for Pacquiao, and the talk now turns to “Pac Man” vs Floyd Mayweather….